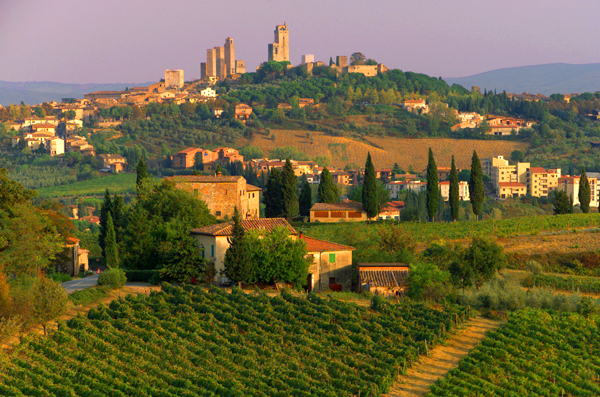 Though the area and the wine known as Chianti is much beloved by the modern traveler, this is a land that has been producing for centuries. Il Casolare is one of the ancient farm buildings that, like Topsy, just grew, and grew until it became the sprawling farmhouse whose contours extend long and jut up and outward. Its present owners took it in gentle hand and with a joyful sense of color and generous hospitality have transformed it into three large houses, all under the same roof, but individual in style and each with its own view of the ancient landscape that surrounds it. Country living in these houses is not rustic. The owners have preserved the terracotta floors and chestnut beamed ceilings and let an ancient layout rule the day, yet they have successfully mixed the antique furniture with bold warm colors, attractive fabrics and all the good-quality appliances a modern cook would want. Continue below to learn more about the property. For a stress free journey allow me to take care of all your travel arrangements and to check availability of this estate contact me, Coleen Lamont. or email me using this online form. Read on to learn more about the amenities available in this area, and at this property. Three apartments in farm buildings. Campalfi, set back from the river Merse by about 200 metres, is a group of ancient farm buildings that once had all the necessities for the self-contained life of a small community. It has been converted to provide seven spacious dwellings. There is a central open-sided courtyard entered through an archway, around which are arranged the apartments, and to one side of this is a large dining-room where the English-speaking owner, a renowned chef, serves wonderful meals every Saturday night and on alternate evenings. The old granary has made a delightful cottage with a patio and an outdoor oven; a large ground floor apartment for five people is at right angles to the granary; and on the ground floor below the old tower is a light and airy apartment for two people. The conversions are a harmonious blend of ancient tradition and modern comforts. 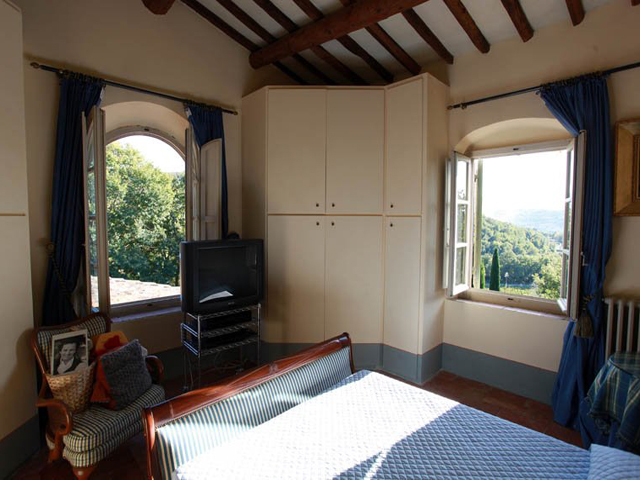 All the apartments have a quiet, cool and restrained atmosphere and make excellent use of attractive fabrics and materials including old terra cotta floors, and simple, traditional Tuscan furniture. The hand of the artist owner is seen in the soft colors that grace the apartment walls and in the blossoms that drape arch and pergola alike. 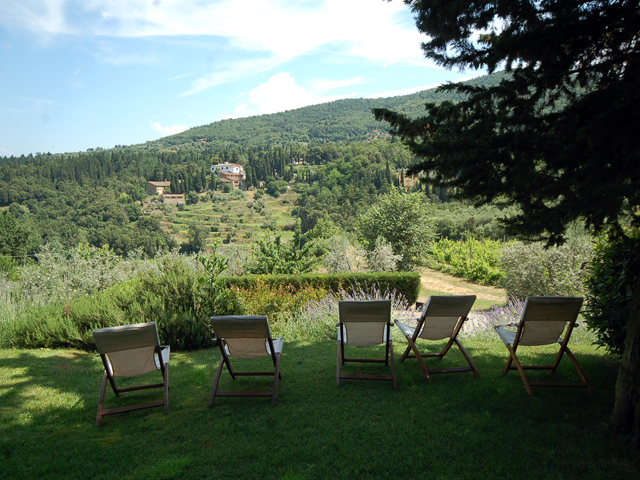 In the countryside just outside Arezzo, Villa delle Rose offers in miniature the reasons visitors include this part of Tuscany in their wanderings. For like the medieval city a mere 3 km away, known for its antiquarian market, the famous frescoes of Piero della Francesca, and the wide piazzas and ancient archways that grace its historic centre, this charming villa combines the traditional look of a respectfully restored limonaia, or lemon house, with the contemporary design and furnishings perfectly in keeping with the Aretine love of artistry and decor. The charm of the villa is seen even as you approach it – its golden stone facade is covered with the pink roses that give the villa its name and the furnished ivy covered pergola set on the wide terracotta terrace surrounding the house is the ideal place for gazing out to the green hills it overlooks. It is sufficiently set apart from the owner’s large villa whose flagstone piazza it shares that it enjoys a sense of protected peace.